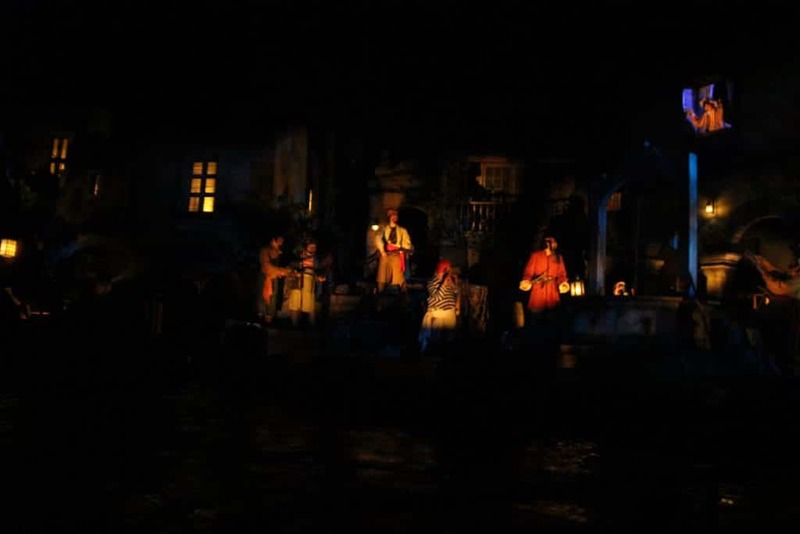 Pirates of the Caribbean returns to Disneyland Paris on July 24th. On Friday, July 14th we had the opportunity to preview the ride prior to its official opening. And we can already tell you, we are really happy with what the Imagineers have done and that Disneyland Paris has one of its top attractions back again. Not much changed on the outside. You could clearly see that some theming items got a well needed clean/touch-up. 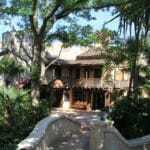 But for frequent guests, the outside is still the same. On the floor, some cracks were still visible, which makes us believe, not that much spent on renovating the outside queue area. The facade itself looks all new and shiny. We took a moment after we rode the ride for the third time to just enjoy the outside. As it is was a preview day, there weren’t that many people walking around which gave us the opportunity to enjoy the exterior of pirates. What we were most excited about though was the inside. 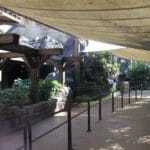 A while ago The Walt Disney Company made an announcement that several changes would be made to the original Pirates of the Caribbean rides across the different Disney Parks and Paris would be the first one to receive these changes. 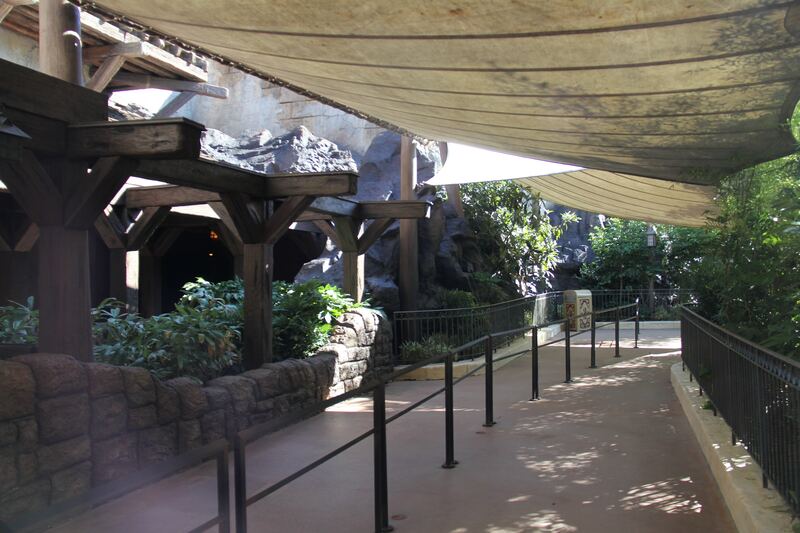 The queue area is still badly lit which is of course done on purpose. It does make it hard to enjoy any details they have added to the ride. I do prefer Pirates at Shanghai more when it comes down to details in the queue. While we walk through the queue area, we notice that it was more of a touch up here and there. Finally we reach the loading area which still looks the exact same. While the boat left the station, we made the first turn towards Captain Jack’s. 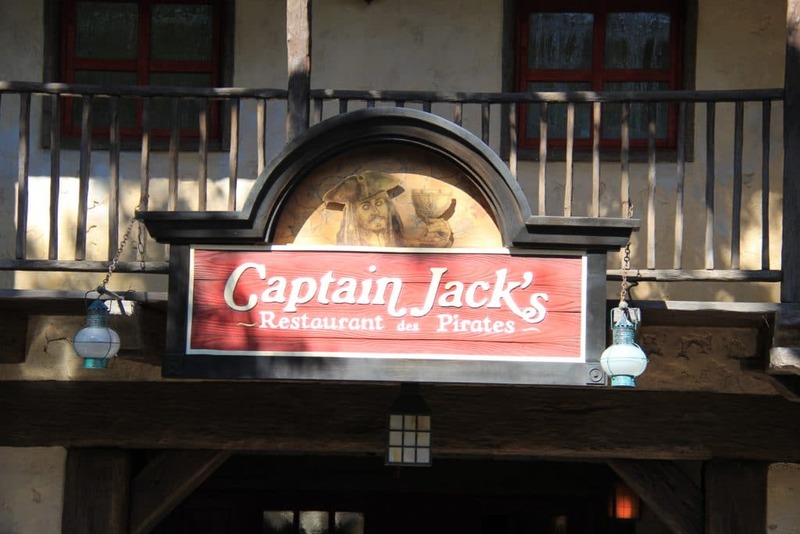 With the name change from Blue Lagoon, Captain Jack’s is flying some pirates flags now, but besides that we only saw some minor cosmetic changes, nothing major you would notice from the boat. At the end of this first scene, we traveled through a broken-up ship where you see a crab and octopus guard a treasure. These animatronics didn’t move all the time, but now they are both working which is nice. The first scene ends with a projected moon which looked sharp and clean. From what I understood, this was supposed to be there in the original ride but I never saw it myself. Now it looked nice and clear. The boat is now lifted to the higher parts of the ride. This part of the ride never felt smooth, and still isn’t. But that is also not what we were looking for. 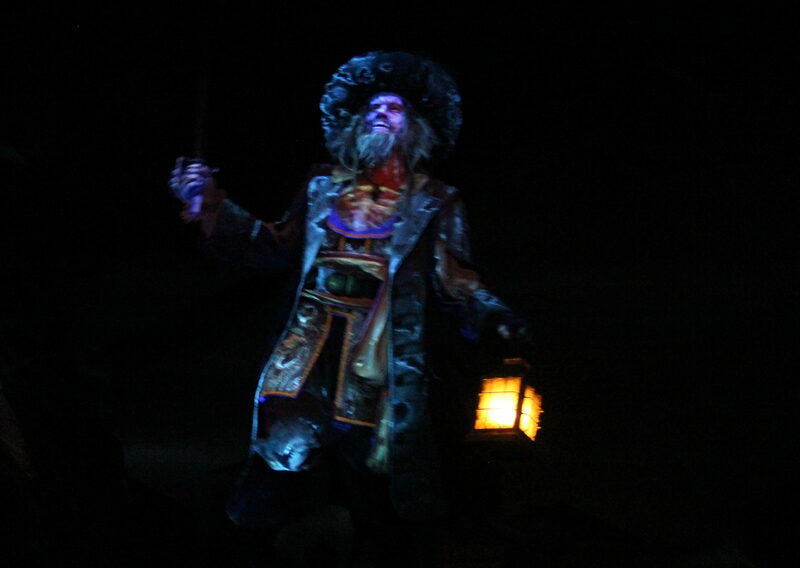 At the end of this scene, you can see a water projection that alternates between Captain Barbossa and Davy Jones. When the boat reaches the top, we enter the jail scene which starts off with a look over a pirate ship which we can see at a lower level. When you look up you see one of the pirates swing over the boat. This is a nice new addition and makes the beginning of the scene also quite lively. When you enter the jail, you can see that the kittens are nicely lit and moving again. After that you see that the jail is on fire and see the prisoners ahead of you, and you pass the prisoners begging for the key on the right. This entire scene clearly had some work done as the scene has nice vibrant colors and you can see the prisoners with the added lighting. 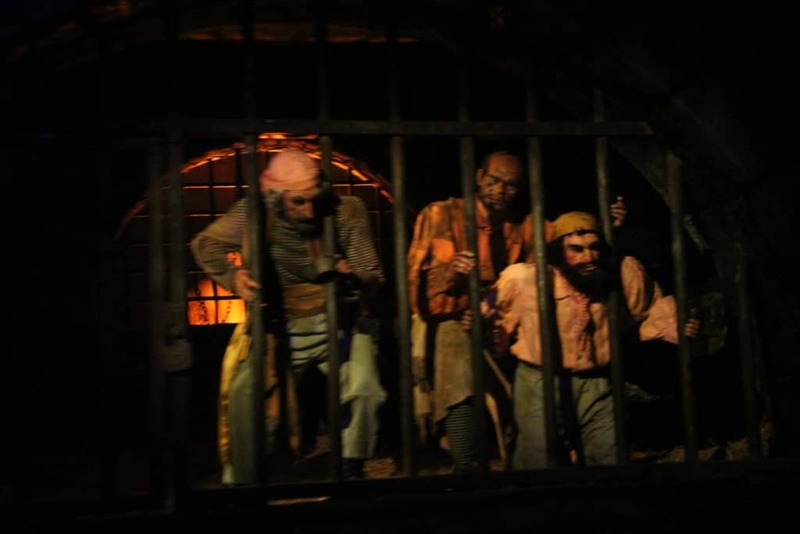 At the end of the jail scene, the boat makes the first drop and ends up in a battle between the Wicked Wench pirate ship and the Spanish town of Puerto Dorado. Several animatronics have been added here, and the explosion effects all work nicely. The sound does feel loud at the times, but it does make sure you feel you are inside the battle that is taking place. Finally we are getting to the parts that have undergone the biggest changes. First we pass a scene on the right with the lady in the window quickly ducking away when a shot is fired. The poor guy who is lowered into the well is still there as well. All the animatronics in this first section have received some well needed wardrobe changes and the colors are vibrant. It also seems like most of the animatronics have received some additional lighting, making sure you don’t miss any of the scenes. While we move forward, we get to the auction scene. Where first brides/wives were auctioned off, now with the Redhead taking a central role in this scene, citizens of the city which is being run over by the pirates sell their goods. All the animatronics have received some well deserved upgrades and look amazing. Their costumes look new, and their faces got some touch-ups. 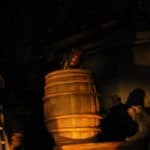 As mentioned before, also here, several animatronics have received some additional spots lights, especially the ones that have ‘a speaking role’. This makes sure you can follow the story a lot better, knowing which character is talking. When we pass underneath the bridge, we can also see the first appearance of Captain Jack. 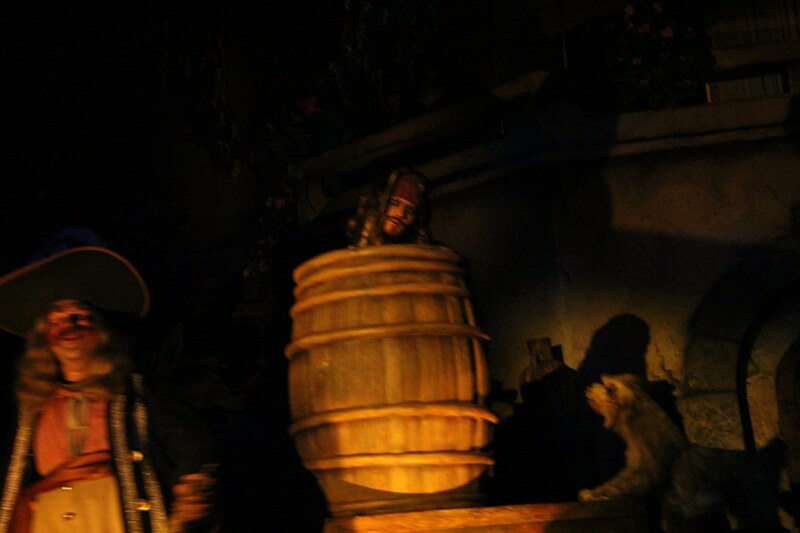 He is sinking into the barrel while the pirate who is leaning against it, is talking to his dog about finding Jack. While we move forward, we see a lady and a pirate have a sword fight. This has a nice touch to it, and the sound matches the actual scene. Nicely done Imagineers! As the boat keeps on sailing, we pass the signing Pirates with their donkey. In the meantime we can see that a part of the city is on fire. No real additions here, besides that the fire/flame effect got a nice upgrade to current day and age. The pirate with his pig friends shows some nice vibrant colors, and it is great to see that the pig animatronics are working again. The guy selling hats is rocking more than I have ever seen before (not sure whether I ever saw him work) and I just love how all the parts rock along with him when he bounces left and right. It is hard to catch all the details in this low lit area, but we are getting to the point of the second and longest drop. The drop itself didn’t change, the ride photo is still taken at this point, but after the drop we will see two more amazing changes to this ride. 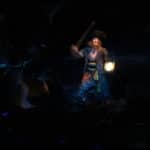 While you are still trying to get your senses back after the drop, you are slowing drifting towards a new major addition to the ride; Captain Barbossa. 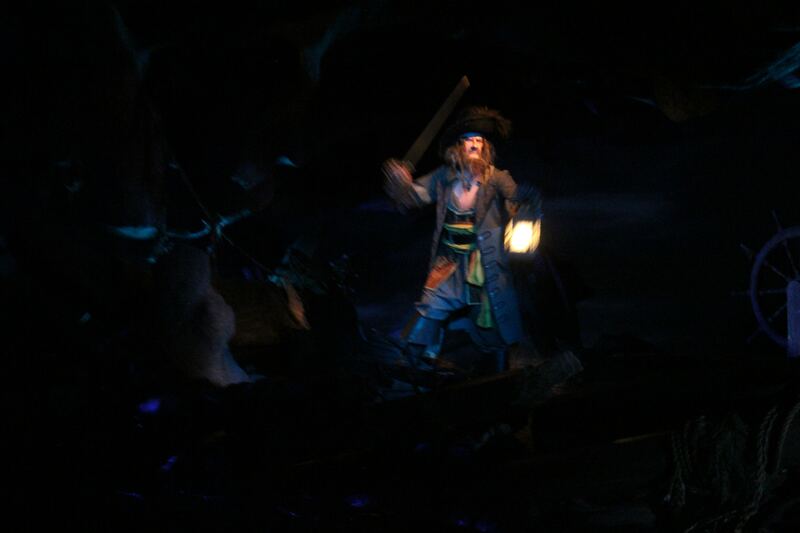 Where we would normally only see a skeleton steer a ship in bad weather, we now see Captain Barbossa. But as we got closer, lightning strikes and Barbossa changes into a skeleton, while he directs us to the last scene with his sword. I must say that this is an amazing effect, similar to what they do a few times at Shanghai Disneyland. The effect for sure fits this version of Pirates quite well. While we make our way through the cave, we are reaching the end of Pirates of the Caribbean. But we still have to see the finale scene; Captain Jack. When we reach the last room, we see Captain Jack sitting on a pile of coins. But Jack is not a skeleton, we can clearly see Jack while he enjoys his treasures. Jack sings; Yo Ho, A Pirate’s Life For Me. 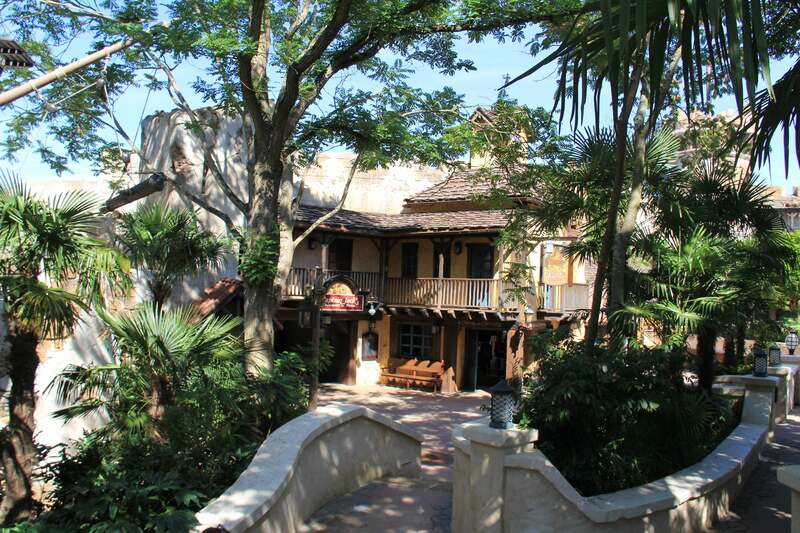 And that unfortunately is the end of this renewed Pirates ride. We love the addition and major changes to Pirates. 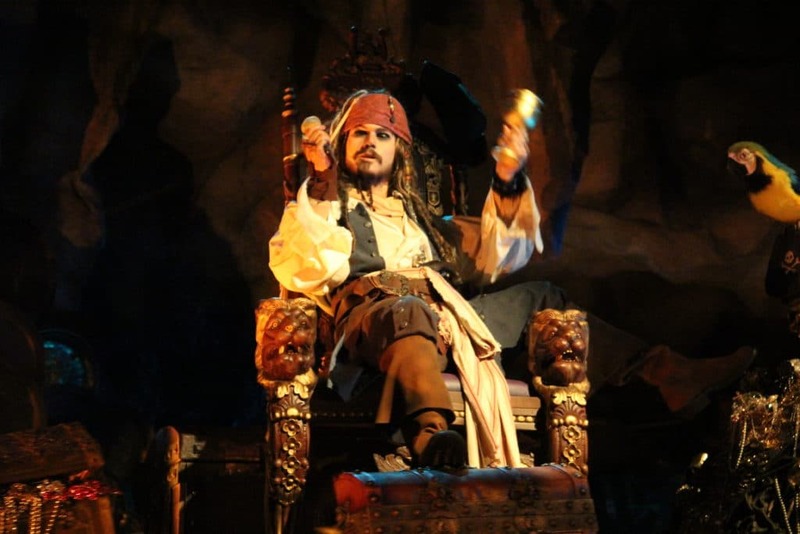 While we understand there are fans who rather not see any changes to their beloved rides, we do think that the changes that have been made to Pirates are a great addition to the franchise (both Disney and Pirates). We also felt that before the animatronics in Paris were of a lesser quality compared to their US counterparts. But that is no longer the case. The change of the auction scene is great, I would have hoped though that they changed it a bit more and put a more emphasis on it. 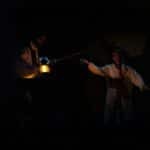 While I love the new sword fighting scene, I’m not sure whether this animatronic scene will work for a long time. Adding Captain Barbossa to that second to last scene is great. I love the new effect. They could have added a bit more audio to it. But the scene speaks for itself. Captain Jack Sparrow on top of the coins is a nice change and fits well into the Pirates franchise. The animatronic looks amazing and moves quite nicely. 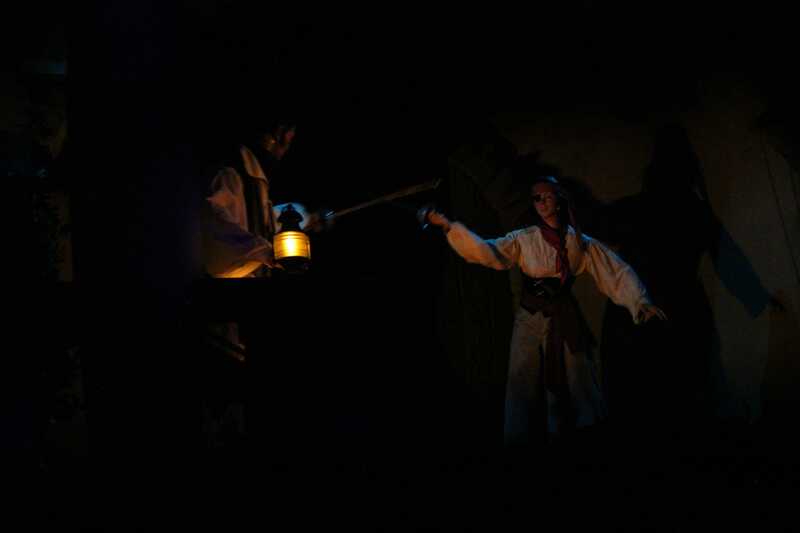 The Imagineers and the Disney team have done a great refurbishment of the Pirates ride at Paris, and it is still a must-ride ride for when you visit Disneyland Paris. 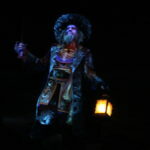 Can’t wait to see what will be done to the other Pirates rides at the other Disney Parks (besides Shanghai of course). 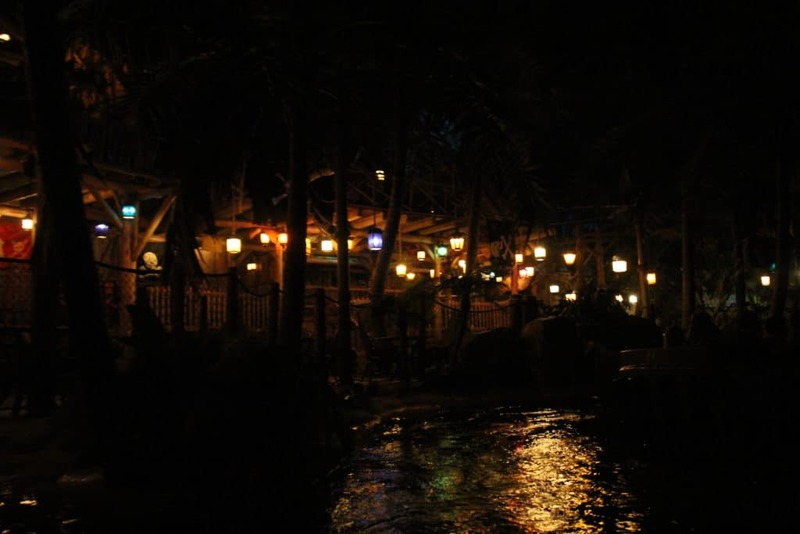 With the renovation of Pirates of the Caribbean, the decision was made to also adjust the theming of the Blue Lagoon restaurant a bit and renamed it to Captain Jack’s. Unfortunately when we were there, Captain Jack’s wasn’t open yet for guests. As soon as we are back at the park, we will ensure that we have reservations to enjoy a meal. From what we see now, the menu didn’t change that much. We did notice that the prices went up a bit. We recorded our ride through Pirates of the Caribbean. You can, of course, watch it, or you can go to the park and experience it yourself. 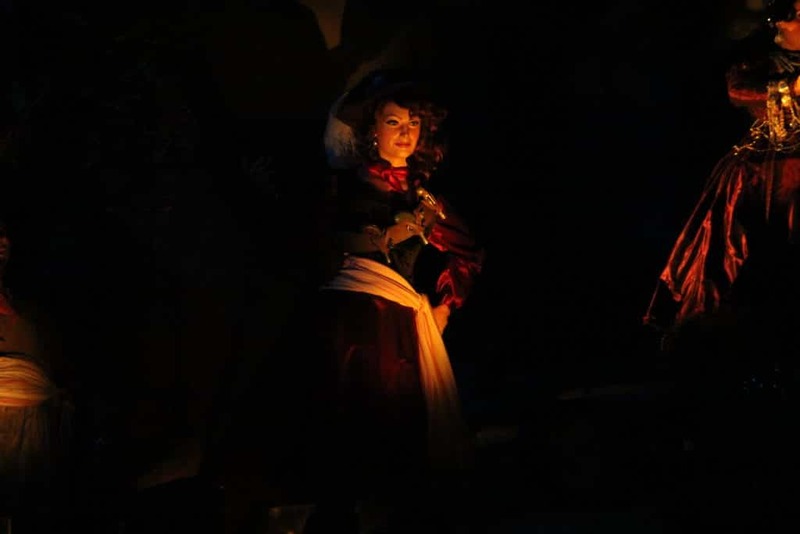 We are excited to hear what you think of the renewed Pirates of the Caribbean at Disneyland Paris.